It’s OK, everyone, we found R.O.T.O.R. Apparently he went on a cross-country execution spree, slaughtering people who bore a slight resemblance to actors who had committed crimes in movies. It was a bit over the top, even for him, but we blame the drinking, which should have no effect on him since he’s a robot but oddly enough it has a major effect on him. He’s a worse alcoholic than Janis Joplin, but a better singer. Anyway, we’ve checked him into robot rehab for the next month. It’s going to be a tough road to recovery, but the rehab facility is going to let him slaughter one homeless person each month so his withdrawals aren’t too overwhelming. As for T.H.O.M.A.S., he’s seen a lot of death and destruction for such a young robot, but he’s been laughing nonstop. We took him to a robot orphanage to see if he can get his robot life straightened out, but it doesn’t look too promising, as he slaughtered three caregivers with a sharpened Lego the first night he was there. If anyone out there wants to open your heart (probably literally) and foster him please let us know. In the meantime, our business here must go on. We’ve hired a temporary replacement for the Today’s Headlines desk until R.O.T.O.R. gets back on his feet. His name is Death Bed: The Bed That Eats, and he’ll be with us starting tomorrow all through the Schlocktoberfest month of October. Please make him feel welcome but DO NOT try to take a nap on him because he absolutely will dissolve your flesh. 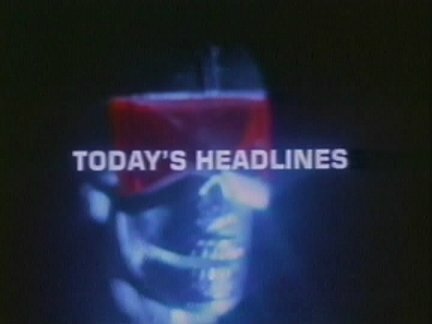 Now on to today’s headlines! Possibly the biggest news in awhile, Carl Weathers is in the new Toy Story Halloween short. Jennifer Lawrence may play a young Kathleen Turner in Dumb and Dumber To, rendering my imagination moot. Westworld will be made into an HBO series. No word on if HBO will give the female fans what they want with a Richard Benjamin appearance. I’ll take T.H.O.M.A.S. I may try teaching him how to emote. It’s worth a shot. T.H.O.M.A.S. really needs the structure of a two-parent household. I’m sure I’ll figure something out. He can watch some old kid movies from my basement. Might need to fast-forward through the villains and stuff. Remember how you first visited our site because you thought it was Schlongtoberfest? I do….. boy was I surprised…. I don’t know about this… will the Death Bed bring us the daily headlines with the same fun and vivacious attitude that R.O.T.O.R. did? There will be a ton of sleeping puns. Excellent! As long as there are puns, I am a satisfied reader. I’m totally on-board with this now.